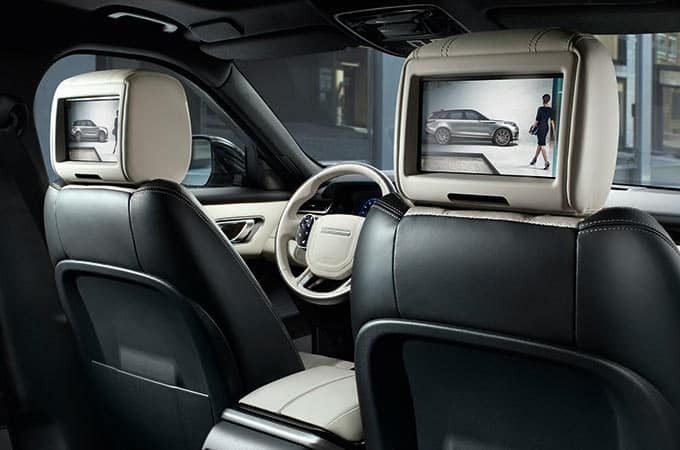 The 2018 Range Rover Velar is filled with innovative luxury features including the exciting infotainment systems. These systems provide easy interaction with the vehicle’s many systems plus a variety of entertainment options. The optional rear seat entertainment has two 8″ screens built into the headrests. They can be controlled independently so rear seat passengers can have entertainment options. The system has two USB 3.0 ports to connect to a variety of devices. The Touch Pro Duo system has dual touchscreens. Use these to interact with multiple features at the same time. The Interactive Driver Display is another convenient system for the Velar driver. You can get it with an optional 12.3″ high definition display. You can personalize your driving experience by choosing the view you would like displayed — single gauge, dual gauges, media, full map, or driver assistance. Our InControl System offers exciting connectivity features. You could experience the optional InControl Apps, Incontrol Remote & Protect™ , and WiFi hotspot. InControl Remote™ allows you to monitor vehicle status through your smart watch or smartphone. Visit Land Rover Colorado Springs to choose from our great selection of the 2018 Range Rover Velar. This small luxury SUV will provide you and your passengers with an enjoyable and luxurious driving experience!